When you ask about great bakeries in the Bay Area, one place people always mention is Tartine. The bakery makes naturally leavened bread and has the distinction of baking loaves in the late afternoon, so that you can take one home right out of the oven for dinner. Or so I hear. 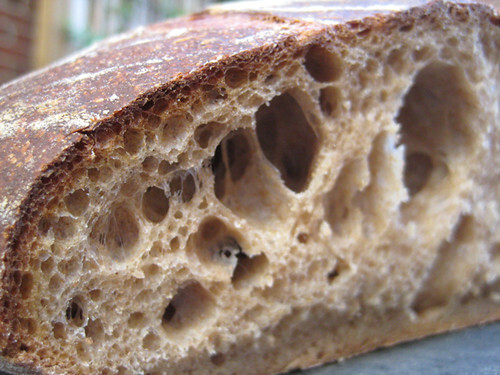 Years ago I tried Chad Robertson's loaves when he up in Point Reyes. At the time, he had a wood fired oven and had built a strong following (a friend took me there on a visit). In fact, a picture of him in front of the hearth with a pile of dark crusty loaves graced the cover of a timeless baking classic, The Bread Builders: Hearth Loaves and Masonry Ovens . During those early years in Point Reyes the small bakery was a laboratory for three ingreidients and a world of possibility: flour, water, and coarse grey salt from the Guérande in southwest France. I made most discoveries by exhaustive trial and error, over time gathering each lesson into a simple approach based on what I had learned. The approach was not rigidly scientific, but results were documented by concise shorthand notes and photos of the bread on days when something notable was achieved in crust or crumb. After years of baking in Point Reyes, I made the loaf I was after. In 2002, Chad and his wife Liz -- a pastry chef -- made the move to the mission district in San Francisco, where they opened Tartine. They baked croissants and quiches in the morning and bread in the afternoon. Although he had to trade the wood-fired oven for a gas-fired deck oven, he wasn't worried. "Any flavor imparted by the wood fire is imaginary," he writes in the book. I would tend to agree, though this is the kind of argument bakers could only settle with a blind tasting and even then would quibble with the results. In any case, this summer, the Tartine Bread book arrived in the mail -- an event I had been eagerly awaiting because I was curious about these loaves: loose and airy, a hint of natural leaven, without the acidity common to sourdough. Could it be done at home? After baking on-and-off with the book for a few weeks, I'd say, yes, with a caveat. The results don't come quickly and like all true craft work, you must put in some time to get what you're after. But you will achieve generously airy breads (like the 70% whole wheat loaf pictured above). Barely a month after the book appeared, home bakers produced some notable loaves with his recipes. Robertson's main departure from standard practice comes with his natural leaven (I'm loathe to use the word sourdough, which is a misnomer, since this leaven is anything but sour). Unlike most leavens made with white flour, he uses 50% white and 50% whole wheat flour. Normally, that would lead to an explosion of activity, since the minerals and bran in whole wheat flour make for a very active starter that can be difficult to master. But he tackles this problem by doing two things: first mixing a large amount of leaven - 400 grams total, or 2-3 cups - with just a tiny tablespoon of starter. Then he ferments it at a rather cool temperature to reduce its activity. The result is a mildly flavored leaven which when added to the dough inoculates the mix with copious amounts of yeast but has very mild acidic notes. Shining though is the sweetness of the wheat, which is probably why San Franciscans line up to get their hands on this bread. Plus the loaves just look gorgeous, judging from the pictures in the book by Eric Wolfinger. His mixing and folding technique for the dough and loaves, while not new, is also not particularly well-known, especially when it comes to home bakers. For anyone wanting to avoid the tedium of kneading or using a stand mixer (another gadget you have to wash), his explanation and the pictures go a long way towards explaining this relatively labor-free technique. Then there's his recommendation of baking in a cast iron combo cooker , which is kind of baking 2.0 compared to Jim Lahey's no-knead method of baking in a Le Cruset pot. The main advantage is that you don't have to drop the loaf into the vessel, which was always a bit troublesome. (Neither of these methods were new -- people have been baking in enclosed vessels for millenium). I don't have a combo cooker (I've come up with other fixes) but I'd be curious to try it. I do have a few quibbles with the book. The basic recipe works best with a high quality all purpose flour but you don't get that tip until reading the detailed notes that proceed the recipe (so yes, read those notes). If you do use bread flour, the loaf will be tough. Finally, the volumes are generous, so you'll have to do some math to make a smaller loaf. This is especially true for the baguette dough, which at 2,300 grams is enough for 6-8 baguettes. The recipe says 2-3, which would be enormous loaves. I shape baguettes at 250-300 grams to fit my oven, which means I usually mix just over 1,000 grams of dough. But these are minor issues. Turn to the recipes at the end and along with the bread, you'll be seduced. Right now, I'm staring at Clarise's Meatball Sandwiches and my stomach is starting to growl. He's also got a savory bread pudding with leaks and mushrooms I'm dying to try (I've got the day-old bread on hand) and a kale ceasar salad, with home-made croutons of course. 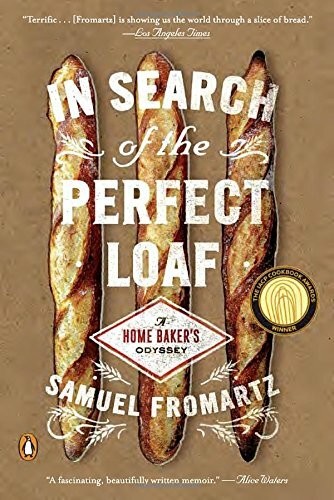 As for the bread recipes, they would be a serious clinic for a beginning baker, which is why I might not tackle this book if trying my first loaf. (It's also why I won't post a recipe: this book is more about technique than adding ingredients together). But if you've made a loaf or two and want to go further, or are simply curious about naturally leavened breads, I could think of no better place to begin. Robertson has graciously opened up his bakery to us, and it would be a shame not to put on an apron and take up his invitation to get busy.